The “From Ochsner with Love” campaign was designed to highlight the outstanding care provided by the Ochsner Cardiology team. Please join us at the second annual Ochsner Cardiology Red Tie Affair to celebrate our accomplishments in heart health and to support cardiology patient care. Together, we can create a stronger, healthier tomorrow. For more information about A Red Tie Affair or how you can get involved, please contact Ochsner Special Events at specialevents@ochsner.org or 504-842-7113. We are excited to once again offer custom Red Tie Affair bow ties and ties from NOLA Couture! Sport your support for cardiac care in the Gulf South with these lovely accessories. 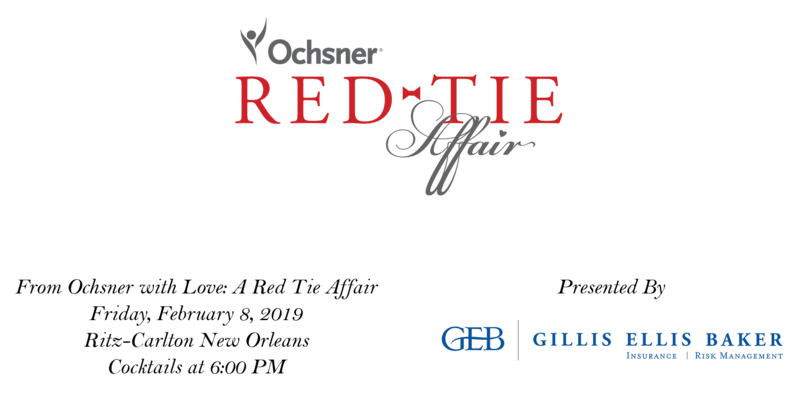 For information or to become A Red Tie Affair sponsor, please contact Kathleen McCulla, Director of Special Events, at 504-842-7125 or kmcculla@ochsner.org. Cocktails will begin at 6:00 PM with dinner to follow. Cocktail attire and red tie preferred. Sponsorship Benefits do include applicable goods and services value of each ticket. *Marketing Benefit is time sensitive.